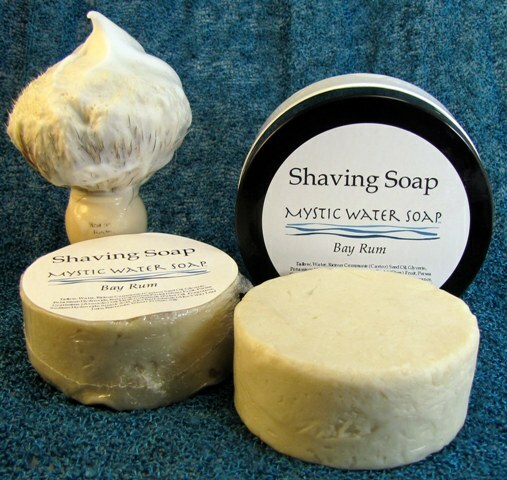 Welcome to Mystic Water Soap's shaving website. If you are new to shaving or are only familiar with vegetable based and glycerin soaps, you might wonder why I use tallow as the primary oil in my shaving soap. Tallow makes an exceptionally dense, slick and slippery lather and is a highly regarded ingredient in many of the finest traditional shaving soaps. I use only food-grade tallow combined with unrefined shea nut butter, avocado and other oils, saponified using sodium and potassium hydroxide and with the addition of soothing aloe vera, bentonite clay, silk, and extra glycerin. The result is a soft soap that lathers quickly with a brush to make a thick, creamy, protective lather that is gentle and non-drying, excellent for even sensitive skin and tough beards. All of my products are made from scratch in small batches, in my home-based business in Maryland. Some of my new soaps also include lanolin, and it will be listed in the description. With thanks to TheVez2 for his great videos! 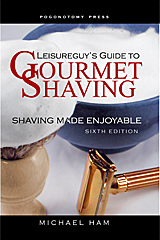 I am listed as one of the recommended artisan vendors in the 6th Edition of LeisureGuy's Guide to Gourmet Shaving. I have some copies that are signed by the author, Michael Ham, available for $13.95. 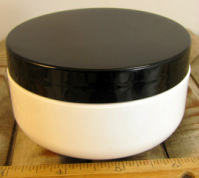 This would make a great companion to a gift of shaving soap or accessories. Sold out! We're waiting for the new and final edition, due in early 2014. 1. Soak your shaving brush in warm water for at least a couple minutes. While your brush is soaking, place a teaspoon or two of water on top of the soap to help soften it. It helps if you have previously "roughed up" the surface of the soap, which allows the brush to pick up soap more easily. 2. Give your brush a few shakes or a gentle squeeze and get some - but not all - of the water out of the brush. Some say that it is better to err on the side of less water prior to loading your brush, as you will be adding more water later, but if the brush is too dry it won't be able to pick up soap at all so please experiment to discover what works best with your brush. 3. Dump the excess water off the soap, then take your brush to the soap and begin to swirl lightly, loading soap into the brush for approximately 40 seconds (a good starting point, adjust as necessary). Your brush should look fully loaded with thick creamy soap proto-lather. If your lather is watery and shows many visible bubbles at this point, you either have not loaded enough soap or have too much water in your brush. 4. Take the loaded brush to your bowl (or face) and begin swirling gently and calmly. Once the lather looks uniformly thick, add a few drops of water either manually (by dripping a few drops of water into the brush or your bowl) or by dipping the very tips of the brush into the water. 5. Continue calmly swirling until the water is fully incorporated and the lather has no visible bubbles. If more water is required, do the same thing again, each time incorporating the water fully before adding more, until your lather reaches the desired thickness. 6. To really make your lather pop, once it reaches the desired thickness on your face, use side to side (or up and down) paint brush type strokes with your brush. In a short time you will be rewarded with a thick slick lather that will give you a close, comfortable shave. Reduced shipping for samples and single pucks! U.S. customers only: to buy any one full-sized puck (with tub or just a refill), shave stick or a set of samples, with half-price shipping, please go to our Samples Page. Just check below to make sure the scent that you want is in stock first! Our pucks are 4 ounces of soft soap in a practical plastic travel container or shrink-wrapped as a refill so you can use the 3" round puck in your own shaving mug or container. Shave Sticks are 2 ounces of soap in a 1.5" diameter plastic screw-up tube, handy for travel or for face lathering. Women like them for shaving their legs and underarms. The sticks are a new product and so if they are not in the drop-down menu of your fragrance choice, it means I haven't poured those yet. 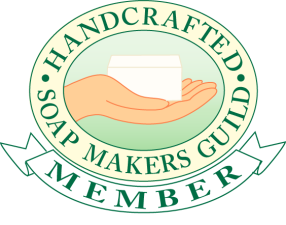 This is where you can place an order for more than one shaving soap or stick. I plan on adding new fragrances from time to time, and invite you to email with suggestions for scents you would like to see. REMEMBER: if you are a U.S. customer buying just one puck or shave stick, go to the Samples Page and get half price shipping! There’s a woodsy quality to this fragrance from oakmoss and vetiver with a touch of myrrh in the base, with some sweet dried tobacco and a little tangerine and soft floral accord. It’s a masculine scent but more understated than either Marrakesh or Cedar & Sage, with less patchouli. I named it in remembrance of my grandfather John "Jack" Murphy who built a log cabin there with his sons and brother back in the 1940’s. Fragrance oil. I had to make it for the almond lovers: here's almond with a just a hint of citrus and floral accord but mostly almond, almond and more almond. Fragrance oil. A classic barbershop fragrance: a masculine scent of aftershave, powder and clean, well-groomed guy. Your partner will be sniffing you all day. Fragrance oil. This is a good version of a classic masculine fragrance that is traditionally made with West Indian Bay leaves (Pimenta Racemosa), citrus and spices. Fragrance oil. An essential oil blend with aromatic bergamot citrus oil in the foreground, supported by woodsy Virginia cedarwood and accented with a resinous, spicy, herbaceous touch of juniper berries. These particular essential oils are especially recommended for oily skin. Essential oils. Virginia cedarwood, Clary sage, oakmoss, patchouli, bergamot, lime and a hint of spice - this is a blend that I make for a bath soap that is popular with everyone who likes the outdoors, but especially men. Please note that Clary sage has an earthy, herbaceous scent and is not the same as culinary sage or white sage. Mostly essential oils with one fragrance oil component. This coconut fragrance oil smells more like fresh coconut than sweetened flaked coconut. This soap starts out creamy white but does turn brown eventually albeit more slowly than the former version - I'm guessing because of a lesser amount of vanilla in the fragrance formula. The emphasis here is on the lime and lemon verbena, with sweet coconut to round it out. I think it will be a nice summer scent. Fragrance oil and essential oil. An herbal combination that is always pleasing, scented using pure botanical essential oils with antiseptic properties. Essential oils. An absinthe-inspired essential oil blend of anise and herbs. If you like black licorice you'll love this one. Essential oils. My version of Green Irish Tweed, the House of Creed fragrance created for Cary Grant. It's a spicy-sweet blend with top notes of lemon and French verbena, green middle notes of violet leaves and iris, on a base of Mysore sandalwood and ambergris. As one of my female customers says, "It smells like a good-looking man!" Fragrance oil. I made this soap for a good customer who requested a lavender scented tallow soap with lanolin and allantoin for a really slick and comforting shave. I used a generous amount of my best Bulgarian lavender essential oil in this one and lanolin-lovers should be happy with the new formulation. All of my shaving soap is made with tallow, but this was the first one that I made with lanolin too. 12/23/2013: While I usually use a Bulgarian lavender essential oil for this soap, I'm trying a good quality French lavender for the current batch. I think the scent is more delicate and less persistent. If you are looking for a very gentle soap for dry skin, and you don't like a strong scent, this is an excellent choice. This blend of Bulgarian lavender essential oil and lime peel oil with natural cooling menthol is a perfect spring and summer scent. A delicate lemon-scented fragrance perfect for summer. Lemon Verbena is a South American shrub and the leaves, when crushed, smell like lemon zest. I've added a bit of lemon essential oil to the fragrance oil to enhance the scent. This classic masculine floral scent smells just like the flower. If you've been waiting for a lilac scent in a tallow soap, here it is. Fragrance oil. Also called Muguet, it's a small white bell-shaped flower that blooms in May and is a traditional floral scent for men. I've been told my version is very good. Fragrance oil. This smells like pure lime: made with lime peel essential oil and a hint of lemon-scented May Chang fruit essential oil (a natural fixative for citrus oils). "Maestrale" is the name of my new shaving soap scented with lavender, rosemary and peppermint essential oils and is the same clean, fresh fragrance blend that I use for my popular Sea Salt soap. The Maestrale wind in Sardinia is a strong wind that blows down from the north bringing clear, fresh weather. "Marrakesh" is my original blend - dark iron-distilled East Indian patchouli, Virginia cedarwood, cinnamon leaf, oak moss, lime and petigrain essential oils, it's a dark smoky blend that I also use in a sea salt soap of the same name. Mostly essential oils with one fragrance oil component. Sandalwood essential oil is used as a base note in 30% of all men's fragrances. Since real sandalwood oil is becoming rare and is very expensive, we use a fragrance oil that duplicates the warm, sweet, woody scent with delicately spicy undertones. This scent lingers on the skin. Sweet orange and tangerine blended with Madagascar vanilla. The soap turns brown due to the vanilla content. Both essential oil and fragrance. A black Keemun tea scent warmed with a touch of vanilla, orange peel essential oil, and a little nutmeg, clove and cinnamon leaf. Perfect comfort scent for cold weather. With lanolin and allantoin. Fragrance oils. New! Cooler and more refreshing than the older version. My peppermint shaving soap uses a double distilled peppermint essential oil for a very pure mint scent, with twice as much cooling menthol as before. Warm spicy pumpkin pie fragrance sweetened with vanilla, with the addition of lanolin and allantoin. Fragrance oils. A delicate, well balanced pairing of tart lemon and freshly cut roses. A combination of essential oil and fragrance. Back by popular request! This is the scent known as "Earth Rose" in my 20% shea butter bath soaps. I used some of my honey from the Sardinian mountains in this delicately scented light brown soap (the color comes from the honey). Fragrance. I've included a lot of good herbal ingredients in this soap including Calendula officinalis (Marigold) flower, aloe vera, sea buckthorn berry oil and allantoin. Although no fragrance oils or essential oils are added to this soap for scent, it does have a mild pleasant natural smell of its own from the ingredients used to make it. There is no saponified coconut oil in any of my shave soaps, which makes them especially gentle and good for sensitive skin. This soap is particularly soothing due to the botanical additions and lack of added fragrance. Another customer special request: tea tree oil has documented antiseptic properties and this soap would be a good choice for anyone with oily or troubled skin. The scent of tea tree oil has been described as "medicinal" but in combination with the Blue Gum eucalyptus the overall effect is invigorating and fresh. Essential oils. 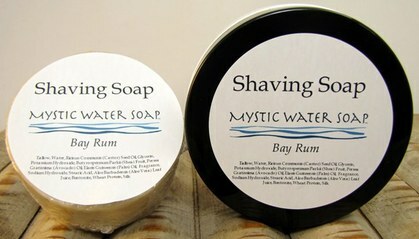 One of my most popular scents in bath soap and shea butter, now available in a shaving soap with lanolin and allantoin. Scented with Mysore sandalwood fragrance oil and Madagascar vanilla, this soap is made with red Moroccan clay. Fragrance. Intoxicating Parma violet fragrance with skin-protecting allantoin added for a comfortable shave. Fragrance. Scented with Lavandin grosso essential oil - as you would expect from a hybrid of cultivated and wild lavender, lavandin oil has a robust, true lavender scent and antiseptic properties. This is an "Old Spice" type fragrance oil and, along with Bay Rum, is one of the best known of the classic masculine scents. It is comprised of top notes of orange, sage & lemon, blending into carnation, geranium, cinnamon, jasmine and heliotrope. The lingering base notes are of vanilla, cedarwood, frankincense resin, tonka bean and musk. Fragrance.